Hard-liners won this round, sinking a nuclear deal with Kim Jong Un. 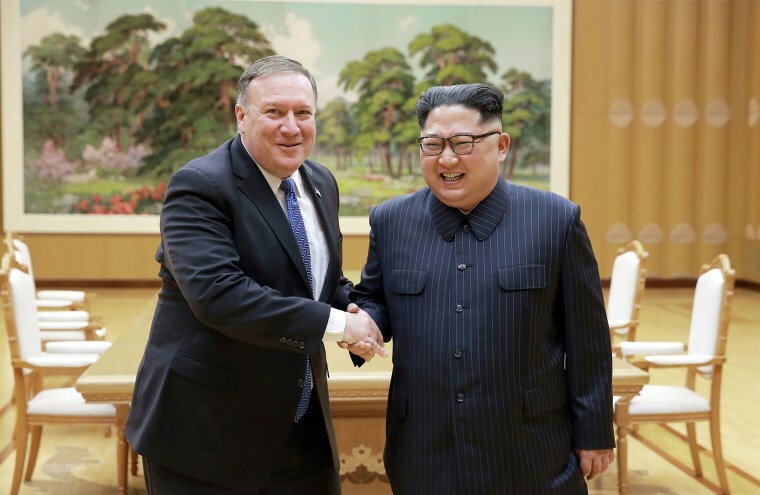 WASHINGTON — It was hard to find anyone in Washington, save President Donald Trump and then-CIA Director Mike Pompeo, who thought a June nuclear summit with North Korean leader Kim Jong Un was a good idea. Now, it's been canceled, or put on hold, and Trump is reminding this country and Kim that the American military is ready "if necessary" to escalate straight from negotiation to war. Japan and South Korea are “willing to shoulder much of the cost” if the U.S. military is forced to mobilize in response to any “foolish or reckless acts” by Kim, Trump said Thursday. Even before Trump sent a letter to Kim canceling the talks on Thursday, North Korea had stopped taking American phone calls. “We got a lot of dial tones,” Pompeo said at a congressional hearing on Thursday. So talk of Trump winning a Nobel Peace Prize, a chant that went up at his political rallies in recent weeks, has also been paused, at least for the moment. And the North Korea hard-liners in his administration can dance to the death knell of a deal not taken. What went so terribly wrong for a president who said he was on the brink of a historic peace deal that would see North Korea give up its nuclear arms and possibly result one day in the withdrawal of American troops from the Korean Peninsula? For starters, members of his own administration — including Vice President Mike Pence and national security adviser John Bolton — leveled thinly veiled threats at Kim while Pompeo was trying to keep talks alive. As late as Wednesday, just hours before Trump pulled the plug, Pompeo said he thought they would go forward. With an internal fight over goals, strategy and tactics fully joined, it would have been next to impossible for Kim to believe that any deal struck would stick. Trump also tried to short-circuit the normal diplomatic process, giving Kim a potential public relations victory without many concessions or conditions. And, with his criticism of his predecessors’ deal-making abilities, Trump had set a bar for himself that would have been very difficult to clear. There was a lot for Trump to lose, and not as much to gain. Perhaps that’s why so many of his allies, including Senate Majority Leader Mitch McConnell, R-Ky., said Thursday that he was right to cancel the summit. The talks were star-crossed from the start, said Ellen Tauscher, who was the State Department’s undersecretary for arms control and international security affairs under President Barack Obama. In terms of the delicate art of international nuclear negotiation, she said, it was a mistake for Trump to try to cut a deal with Kim before the details of the agreement could be worked out by their underlings. By agreeing from the very beginning to give Kim a photo op meeting with the President of the United States — publicly scheduling a summit with Trump right away, rather than using the possibility of such a session to negotiate the shape of that discussion from a position of strength — they handed a big prize to the North Korean leader. They got very little in return. But there were major substantive problems, too, not least of which was the disagreement within the administration about the desired outcome of the talks. “We don’t know what the Trump administration wants to do,” Tauscher said. Less than two weeks ago, Pompeo and Bolton offered different takes on what North Korea would have to do to get the U.S. to ease economic sanctions and move toward more normal diplomatic relations. “America’s interest here is preventing the risk that North Korea will launch a nuclear weapon into L.A. or Denver or to the very place we are sitting here,” Pompeo said from Washington on "Fox News Sunday" on May 13. But Bolton, a longtime advocate of regime change in North Korea before he joined the Trump administration, told ABC on the same day that the goal was “getting rid of all the nuclear weapons,” not just those which imperil the U.S. He has pointed to the “Libya model,” a reference to the agreement President George W. Bush secured from Muammar Gaddafi to give up his nation’s nuclear program. Trump himself rejected the idea of a Libya model for North Korea, hinting that he understood what Pyongyang was wary of: Gaddafi, following a U.S.-led bombardment of his country, was dead within a decade. If he was trying to blow up a possible nuclear deal, it worked. North Korea responded by calling Pence a “political dummy,” a comment that Trump cited in his decision to announce an end to talks with a country that already had ceased communication with his administration. Even without the specter of sabotage, Trump had set himself up to clear an impossibly high diplomatic bar in record time. Bruce Klingner, a senior research fellow and Korea expert at the conservative Heritage Foundation, wrote this week that Trump “may have painted himself into a diplomatic corner” early on in the discussions. Because Trump had been so harshly critical of past administrations’ nuclear negotiations with Pyongyang and with Iran, Klingner wrote, he could only claim victory if he struck a deal with Kim that was “better than the Iran nuclear agreement, previous international denuclearization accords with North Korea, and U.N. resolutions imposing punitive measures on North Korea” — and at least as stringent in verification procedures as gold-standard treaties with Russia. But Rachel Bovard, senior policy director for the Conservative Partnership Institute and a former GOP foreign policy aide on Capitol Hill, said the re-engagement with North Korea already has been successful in some ways. "The North Korea summit was the most substantial effort we've seen in decades on denuclearizing the region, and resulted in three Americans coming home safely," she said. How does Trump's summit cancellation impact US allies? And, she said, Pyongyang's behavior suggests that the time might not be quite right for a deal. "I’d much rather withdraw from a summit where North Korea is going to act in bad faith than press ahead simply for appearances," she said. "This is what real negotiation looks like — a back and forth, starting and stopping. The failure of this summit is clearly not the end of efforts to deal with Kim Jong Un." That's basically what Trump said Thursday, even as he mixed in some menacing words about the strength of the U.S. military. But Jake Sullivan, who was national security adviser to Vice President Joe Biden, said it’s difficult to tell where Trump will go from here on North Korea.